National Council on Disability Affairs (NCDA) Deputy Executive Director Mateo A. Lee, Jr. (3rd from left) presents a “PWD-Friendly Website Award” Certificate to Department of Social Welfare and Development (DSWD) Assistant Secretary Vilma B. Cabrera in recognition of the Department’s compliance to the Web Accessibility Standards set by the Philippine Website Accessibility Group represented by its President, Mr. Remberto I. Esposa, Jr. (Extreme Left) and the National Computer Center-Information and Communications Technology Office. 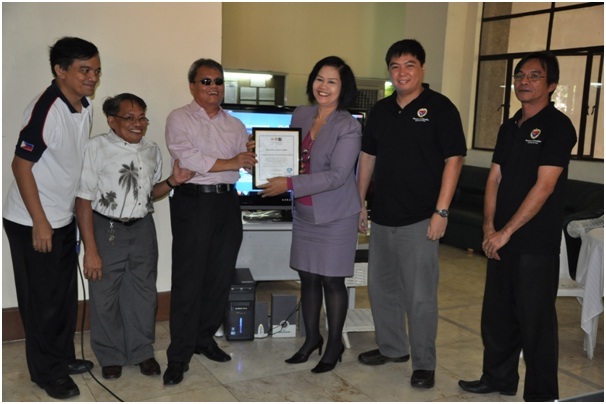 The ceremony, which also served as the launching of the DSWD’S PWD-Accessible Website was held last January 20, 2012 at its Central Office. Others in photo include (from left to right) NCDA’s Project Evaluation Officer Reginaldo Tolentino, DSWD Officer-in-Charge of Management Information Systems Service Felino O. Castro V, and DSWD Webmaster Manuelito C. Bongabong. hi i am alvin queyquep,i dont have a right hand since birth, i am looking for a job like a callcenter BPO industry here in makati but i am a high school graduate. I am asking fora help to train me and give me a chance to be a good CSR, this is my dream job. God Bless po… thanks!